Schrödinger wrote a letter to Einstein after the 1935 EPR paper, and in that letter Schrödinger used the German word "Verschränkung" which translates into "entanglement", but when was the word first used in English? Schrödinger's 1935 paper written in English, called Discussion of Probability Relations between Separated Systems, says (according to Wikipedia) "I would not call [entanglement] one but rather the characteristic trait of quantum mechanics, the one that enforces its entire departure from classical lines of thought" which means the concept was there but it whatever word he used for it was not entanglement (hence the square brackets). Unfortunately I do not have access to the full paper. I managed to get access to the paper mentioned in the question. Schrödinger in 1935 (the same year the original EPR paper was published) wrote in English: "By the interaction the two representatives (or $\psi$-functions) have become entangled." This was in the abstract. He also wrote later in the paper: "What constitutes the entanglement is that $\psi$ is not a product of a function of x and a function of y." He also used the term "disentanglement"
According to Matthias Christandl (who did some research on this to resolve a bet with Artur Ekert), while the term "entanglement" was first used in 1935, as already relayed in other answers, the concept was discussed by Schrodinger in 1932. This set of slides (slides 3-8 in particular) from a talk reproduce part of a document that details this. The full image is also on the front of his thesis. entanglement (n.) 1630s, "that which entangles," from entangle + -ment. From 1680s as "act of entangling." Foreign entanglements does not appear as such in Washington's Farewell Address (1796), though he warns against them. The phrase is found in William Coxe's 1798 memoirs of Sir Robert Walpole. tangle (n.) 1610s, "a tangled condition, a snarl of threads," from tangle (v.). I make this connection because the idea of determinacy and strings/threads goes back to at least the ancient Greek Moirai (the Fates). Not the answer you're looking for? Browse other questions tagged entanglement terminology history or ask your own question. Is there any classical analogy for quantum entanglement? 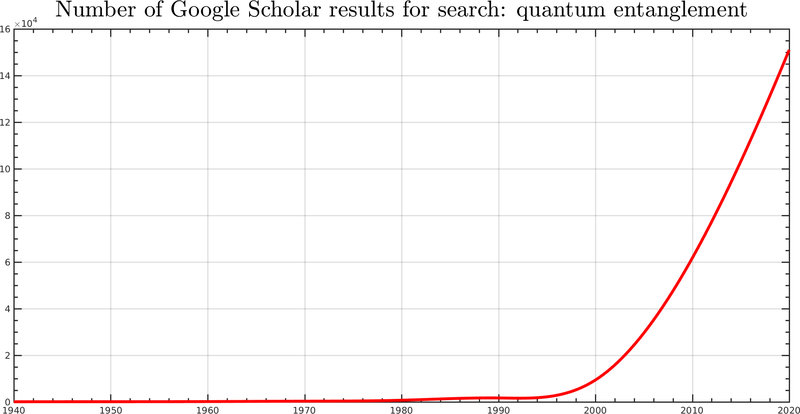 Does entanglement correlate qubits a $100\%$ of the time?